In the UK alone, over 3.25 million people are thought to be affected. In many cases, people are just not aware of their conditions and continue to suffer in silence. The most common symptoms are bloating, wind, diarrhoea and abdominal pain caused by undigested lactose passing through the digestive system. Now there is a quick and easy way to find out whether you may have the condition. 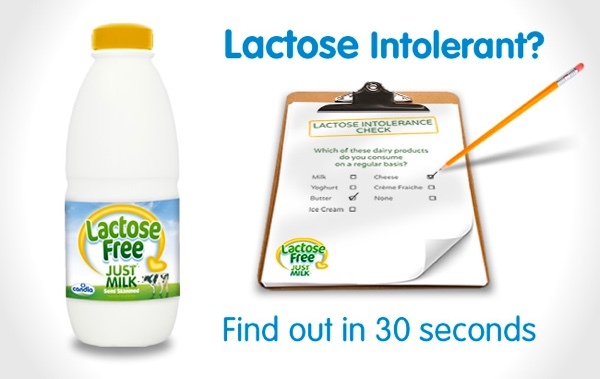 Our newly launched Lactose Intolerance checking tool will give you an answer in 30 seconds flat and then it will advice you on next steps should you be lactose intolerant. Of course, if you are a sufferer, then JUST MILK’s Lactose Free Milk will be perfect for you with the great, creamy taste you’ve come to expect without lactose that can cause you stomach upset and irritation.